Hollywood’s version of Captain America met a real life version on Capitol Hill this week. Chris Evans, the blockbuster actor who plays the comic book hero in Marvel’s Avengers series, was pictured with House Rep. Dan Crenshaw on Friday. 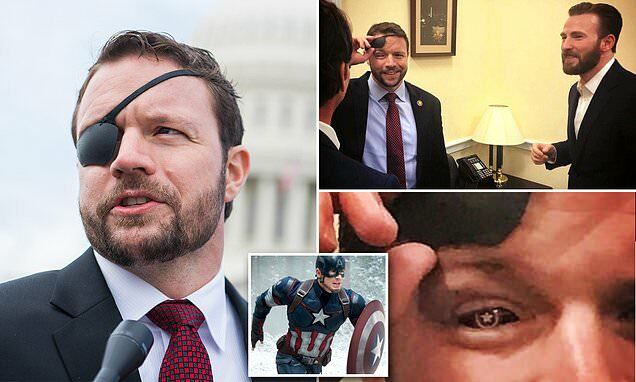 But Crenshaw, the Texas Republican who lost an eye during combat service in Afghanistan, had a surprise in store for Evans - a glass eye with the famous Captain America logo. ‘When Captain America sees your Captain America glass eye,’ Crenshaw tweeted on Friday.